*1: “Journalism for Sale“.The first series was launched on February 1, 2017. Today, coincidentally, is September 11. In addition to being the anniversary of the attacks in the USA 16 years ago, the date is bitter and auspicious here too. Three years ago today, the president of the Asahi Shimbun, Tadakazu Kimura, retracted a major investigative story about the Fukushima Dai-ichi nuclear plant under pressure from conservative forces. 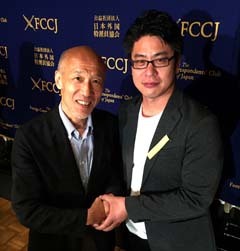 Kimura apologized and the journalists responsible for the story were punished. Three months later in this room of FCCJ, I gave a joint press conference to protest that retraction (FYI: YouTube). The birth of Waseda Chronicle is a consequence of that suppression of investigative journalists, who subsequently left the Asahi.